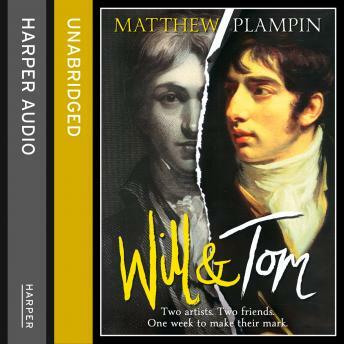 Will & Tom is a glimpse into the life of the infamous artist JMW Turner as a young man during a week spent at Harewood House fighting for a commission against his childhood friend and rival Tom Girtin. When rising artist Will Turner arrives at Harewood House in high summer, his intention is to sketch the house and grounds, receive his commission and return to London, where he has started attracting serious attention at the Royal Academy. But things at the grand house are not quite as he expects. The atmosphere is strange, both above and below stairs, and Will's treatment by his hosts is surprisingly offhand. Most perplexing of all, however, is the appearance of another painter - his childhood friend and now rival, Tom Girtin. While Tom is welcomed into the aristocratic circle, Will finds few allies. As it becomes harder to ignore the whispers of scandal , Will witnesses something that will threaten both his commission and his friendship. Alive with intrigue, artistic rivalry, Will & Tom offers a glimpse into the early life of Britain's greatest painter, J M W Turner, through the story of a complicated, vibrant friendship, and how it is tested by the dark dynamic of art and power.